Shades not included. Measurements: Overall: 32" height form base to top of finial. Height can be adjusted by adding. taller or shorter harp. Form: 8" l/w x 8"deep x 19.5" ht from base to bottom of harp. 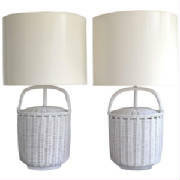 Striking Mid-Century whitewashed woven rattan basket form table lamp, circa 1960s - 1970s. Shade not included. Measurements: The height from the base to the top of the harp is 26". The height to the bottom of the harp is 15" and the height for shipping is 18". The diameter of the basket form at it's widest point is 20" diameter and it is 15"diameter at the base. 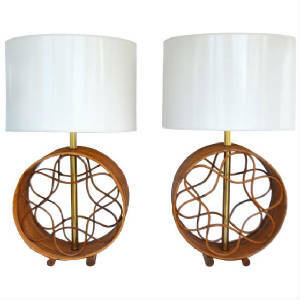 Sculptural pair of Mid-Century reed and bamboo circular form table lamps, circa 1960s. These stunning lamps are designed of graphic twisted reed elements mounted in bent bamboo forms. Lamps have been rewired with brass fittings. Shades not included. Overall measurements: 31" Ht to top of harp, 19" H to bottom of harp, 9" D x 15.25" W (Diameter of form). Height can be adjusted by adding a larger or smaller harp. 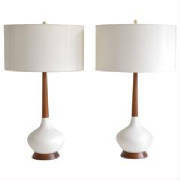 Impressive pair of Mid-Century table lamps by the Marbro Lamp Company, circa 1950-1960. These striking lamps with etched verdigris decorative accents are mounted on ebonized wood bases and wired with double cluster sockets. Measurements: Overall Height: Base to top of finial 43"
Height can be adjusted by adding a smaller or larger harp. Stunning Hollywood Regency Asian inspired reticulated Blanc de Chine Table lamp, c. 1940s -1950s. This incredible pierced porcelain table lamp accented with foliate decoration is mounted on an ebonzied base and wired with brass adjustable fittings. Sold without shade. Overall: Base to top of finial 38" ht (height is adjustable from depending on size of harp used. Form: 10"diameter x 23" ht. 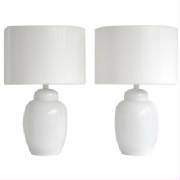 Pair of striking Mid-Century white glazed ceramic jar form table lamps, circa 1960s-1970s. These sleek sculpturally designed lamps are refitted with brass hardware. Overall: 32" height from base to top of finial x 9" diameter. Actual Form: 19" height form base to bottom of harp x 9" diameter. Note: Overall height can be adjusted by adding a larger or smaller harp. 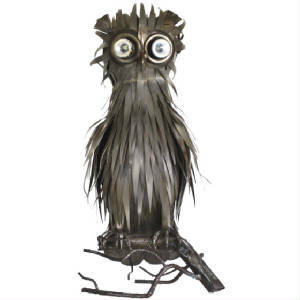 Sculptural Mid-Century Brutalist artisan crafted torch cut owl form table lamp by Michel Jarry, circa 1960s-1970s. This French Industrial lamp of hand-cut metal features two light sockets as eyes. 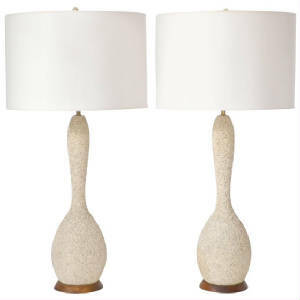 Stunning pair of Mid-Century sand glazed textured ceramic table lamps, circa 1950s - 1960s. 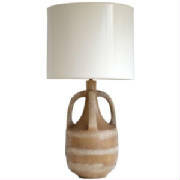 These artisan crafted hand thrown gourd form table lamps are mounted on turned wood bases and wired with brass fittings. Shades not included. Measurements: The height from the base to the top of the harp is 34.5" x 8.5" diameter. The height from the base to the bottom of the harp is 25". The height for shipping is 27.25". The height can be adjusted by adding a smaller or larger harp. Architectural Mid-Century white molded acrylic floor lamp / table lamp with chrome fasteners by Neal Small, circa 1960s - 1970s. Pair of sleek Mid-Century geometric form table lamps, c. 1960s - 1970s. 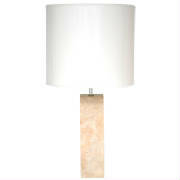 These ivory glazed ceramic lamps are designed with a slender silhouetted profile. 32" height to the top of the finial x 12" width x 4.5" depth. Height of ceramic form is 17"
The overall height can be adjusted by adding a smaller or larger harp. 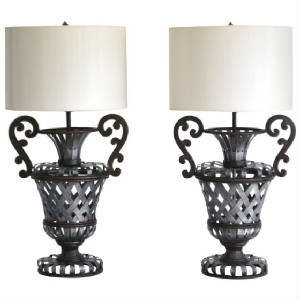 Glamourous pair of Hollywood Regency style wrought iron basket weave urn form table lamps, circa 1960s-1970s. These stunning artisan crafted hand-forged lamps are wired with brass fittings. Overall: 39.5" height to top of finial x 18" l/w x 12" deep. Form: 24.5" height to bottom of harp x 18" l/w x 12" deep. Striking Mid-Century ceramic jar form table lamp, circa 1950s-1960s. 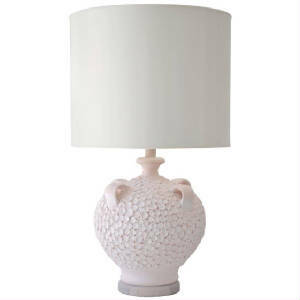 This stunning artisan crafted hand thrown sun bleached coral glazed ceramic lamp is mounted on a turned whitewashed wooden base. Shade not included. Measurements: The height from the base to the top of the harp is 34". The height to the bottom of the harp is 20" and the height for shipping is 23". The diameter at the widest part of the ceramic form is 16" and the diameter of the base is 8". The overall height can be adjusted by adding a smaller or larger harp. Stunning pair of brushed metal Post-Modern geometrical form table lamps by Robert Sonneman for George Kovacs, circa 1980s-1990. Height to top of finial is 31.5", height to bottom of harp is 18.5". Form is 12" L/W x 3.5" deep. Overall height can be adjusted by adding a smaller or larger harp. 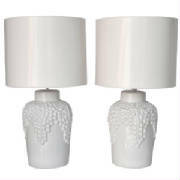 Striking Pair of Mid-Century white crackle glazed ceramic bottle form table lamps, circa 1950s -1960s. These artisan crafted sculptural lamps are mounted on turned wood bases and wired with brass fittings. Shades not included. Measurements: The height from the base to the top of the harp is 35" ht x 6.5" diameter. The height from the base to the bottom of the harp is 23" ht. The height for shipping is 26" ht. 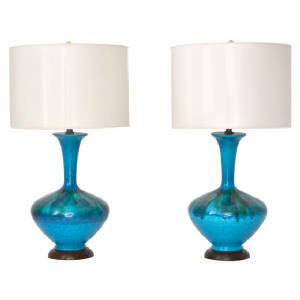 Stunning pair of Mid-Century blown glass bell jar form table lamps, circa 1950s - 1960s. These highly decorative clear blown glass lamps are mounted on hand turned oak bases and rewired with antique brass adjustable double cluster fittings. Shades not included. Measurements: The height from the base to the top of the riser is 43". 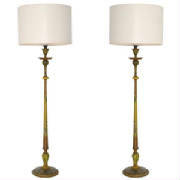 The diameter is 12.5"
Exquisite pair of Mid-Century patinated brass candlestick table lamps, circa. 1940s - 1950s. 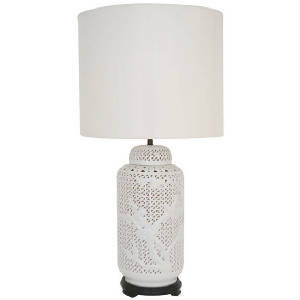 These stunning table lamps are embellished with an open fretwork design. The brass forms are mounted on turned ebonized wood bases. Shades not included. Measurements: The height from the base to the top of the harp is 41". The height from the base to the bottom of the harp is 27". The height for shipping is 30". The larmps have a diameter of 9". The height can be adjusted by adding a smaller or larger harp. 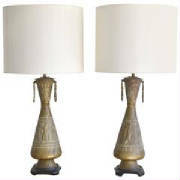 Stunning pair of Mid-Century etched brass candlestick table lamps, circa 1950s - 1960s. 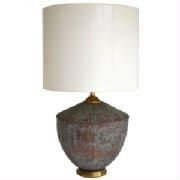 These glamorous artisan crafted lamps are mounted on turned fruitwood bases and wired with brass fittings and silk cords. Shades not included. Measurements: The height from the base to the top of the harp is 44". The height to the bottom of the harp is 33.5". The height for shipping is 36". The diameter of the lamps is 9". The height can be adjusted by adding a smaller or larger harp. 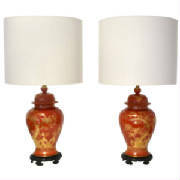 Stunning pair of Venetian hand painted carved wood candlesticks table lamps, circa 1920s. 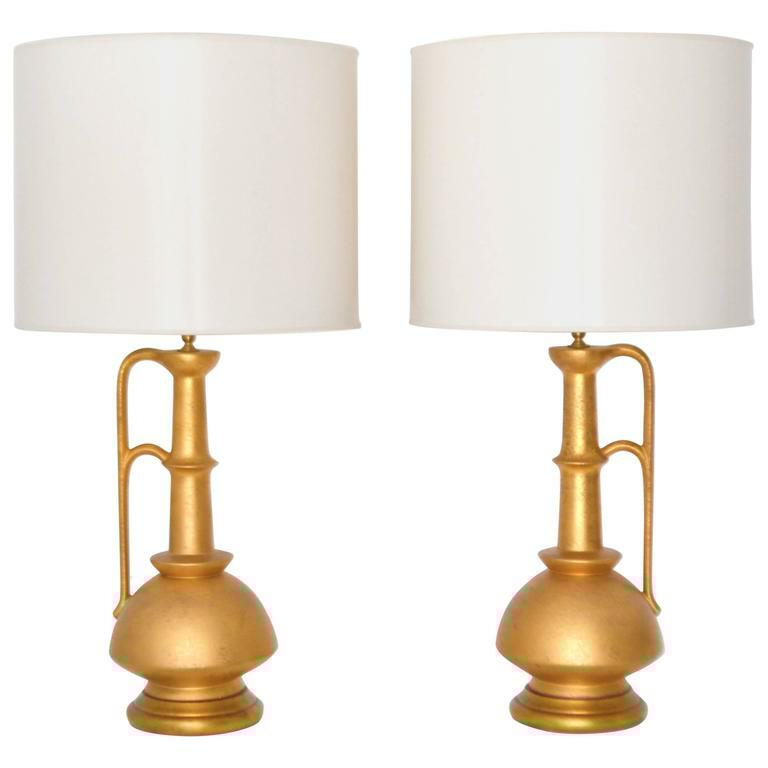 These artisan crafted Italian lamps are rewired with brass fittings. Shades not included. Measurements: The height of the lamps from the base to the top of the harp is 56". The lamps are 10" diameter. The lamps are 46" height from the base to the bottom of the harp and 49" heigh for shipping. The height can be adjusted by adding a larger or smaller harp.. 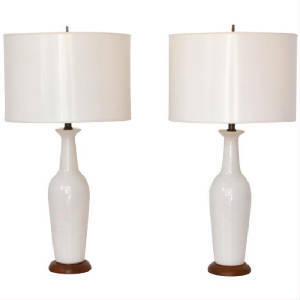 Striking pair of Mid-Century long necked ceramic table lamps, circa 1960s. These sculptural ceramic white glazed lamps with elongated wooden necks made of walnut are mounted on turned walnut bases and wired with brass fittings. Shades not included. Measurements: The overall height from the base to the top of the harp is 30". The diameter is 11". The height from the base to the bottom of the harp is 20.5". The height can be adjusted by adding a smaller or larger harp. 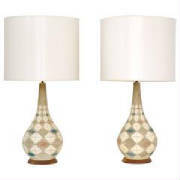 Striking pair of Italian Mid-Century ceramic jar form table lamps, circa 1950s - 1960s. These glamorous highly decorative gilt glazed lamps are mounted on carved gilt wood bases and wired with brass fittings and silk cords. Shades not included. Measurements: The overall height from the base to the top of the harp is 39.5" x 11" diameter. The height of the form is 26" from the base to the bottom of the harp. The height can be adjusted by adding a larger or smaller harp. Remarkable Mid-Century Modern white glazed ceramic table lamp, c.1950s -1960s. Sculptural and highly graphic, this decorative Blanc de Chine crackle glazed lamp is composed of pierced ceramic with a contrasting muted sea glass interior glaze and is mounted on a cream lacquered wood base. Shade not included. 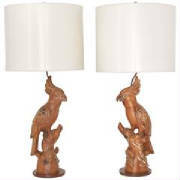 Striking pair of Mid-Century hand carved wooden parrot form table lamps, circa 1950s - 1960s. These stunning artisan crafted sculptural lamps are wired with brass fittings. Shades not included. Measurements: The overall height is 43" from the base to the top of the harp x 10" diameter. The form height is 29" from the base to the bottom of the harp. The height can be adjusted by adding a smaller or larger harp. Striking Mid-Century chrome table lamp, circa 1960s - 1970s. 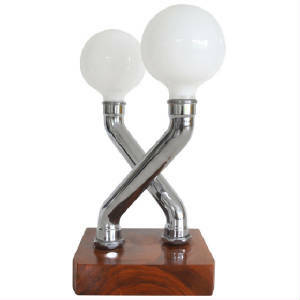 This sculptural classical lined lamp is designed of polished chrome tubular cylindrical column supports with a white round sputnik shaped glass globe. 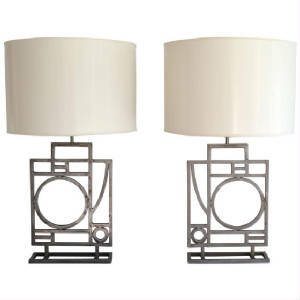 Striking pair of Mid-Century highly decorative patinated pewter Chinoiserie inspired candlestick table lamps with ebonized capitals and brass adjustable hardware, circa 1950s - 1960s. Shades not included. Measurements: Overall 38" height from the base to the bottom of the finial x 7" length x 7" wide. The height is adjustable. 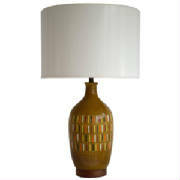 Striking Mid-Century Italian ceramic table lamp, circa 1950s-1960s. This stunning hand thrown lamp with deep variegated glazing of olive greens is accented with abstract polychrome graphic shapes and mounted on a turned wood base. The lamp is wired with brass fittings. Overall: 30" ht from base to top of shade x 11"diameter. Form: 19.5" to bottom of the harp. 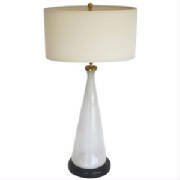 Height can be adjusted by adding a smaller or larger harp..
Mid-Century Italian blown glass table lamp, circa 1950s - 1960s. 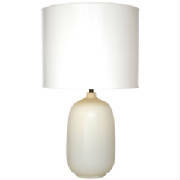 This exceptional Art Moderne inspired white opaque glass lamp is fitted with brass hardware and mounted on a black leather wrapped wooden base. Shade not included. Measurements: 34" height from the base to the top of the shade x 10" diameter. 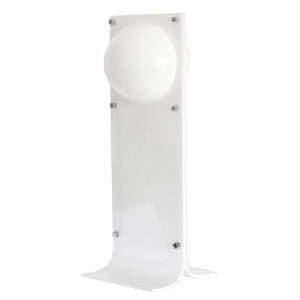 The form is 26" height from the base to the top of the socket. The height can be adjusted by adding a larger or smaller harp. 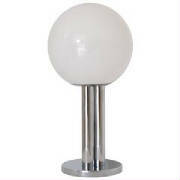 Sculptural Post-Modern ball form table lamp, circa 1980s. 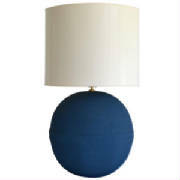 This striking large scale artisan crafted sphere form lamp is designed of blue corrugated cardboard and wired with brass fittings. Shade not included. Measurements: 35" height from base to the top of the finial x 18" diameter. The form is 19" height from the base to the bottom of the harp. The height can be adjusted by adding a larger or smaller harp. 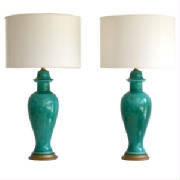 Stunning pair of Hollywood Regency green glazed ceramic table lamps, circa 1950s-1960s. 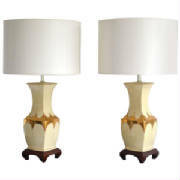 These glamorous hand thrown ginger jar form lamps are mounted on giltwood bases and wired with brass fittings. Shades not included. Measurements: 34" height from the base to the top of the shade x 7.5" diameter. The form is 25" from the base to the bottom of the harp. The height can be adjusted by adding a larger or smaller harp. 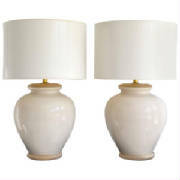 Striking pair of Mid-Century Blanc de Chine ginger jar form table lamps, circa 1960s-1970s. These artisan thrown white glazed lamps are wired with brass fittings. Shades not included. Measurements: Overall: 28" height from base to top of the shade. x 9.5" diameter. The form is 17" height from the base to the bottom of the harp. The overall height can be adjusted by adding a smaller or larger harp. Striking pair of graphic Post-Modern ceramic jar form table lamps, circa 1970s - 1980s. These highly decorative artisan crafted polychrome drip glazed lamps are designed with an incised geometric pattern and wired with brass fittings. Measurements: Overall: 32" height from base to top of shade x 9" diameter. Form: 19.5" height from base to top of shade. Height can be adjusted by adding a smaller or larger harp. 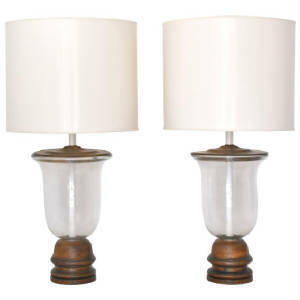 Stunning pair of Hollywood Regency stacked glass table lamps, circa 1950s. These deco-inspired clear glass lamps in the manner of James Mont are composed of alternating blown glass and brass elements and are mounted on turned giltwood bases. Shades are not included. 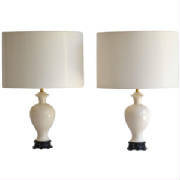 Glamorous pair of Hollywood Regency Blanc de Chine ceramic table lamps, circa 1940s-1950s. These stunning white glazed lamps are mounted on black lacquered open fretwork hand wrought iron bases and wired with brass fittings. Shades not included. 26" ht from the base to the top of shade x 6" diameter, the ceramic form is 13" ht from the base to the bottom of the brass risor, the risor is 4"ht. The overall height can be adjusted by adding a smaller or larger harp. Sculptural Post-Modern articulated table lamp by Paolo Piva for Stefano Cevoli, circa 1980s. This sleek and graphic Studiodada "Meridiana" black matte metal finished desk lamp is designed to articulate to varying heights and angles. 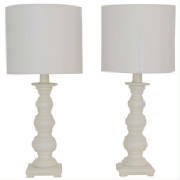 Stunning pair of Hollywood Regency style Blanc de Chine balustrade form table lamps, c. 1960s - 1970s. 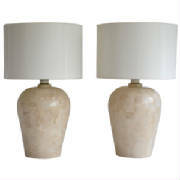 These decorative white glazed lamps are mounted on antiqued brass bases. Shades not included. Overall: 34"HT x 8.5" L x 8.5" W; Height can be adjusted by adding a taller or a shorter harp. 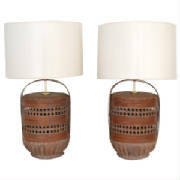 Pair of striking Mid-Century terracotta table lamps, circa 1960s -1970s. These sculptural and highly graphic hand thrown ceramic lamps are mounted on white lacquered turned wood bases and wired with brass fittings. Shades not included. Overall: 26" height from base to top of finial x 11" diameter. Form: 13" height to bottom of harp. 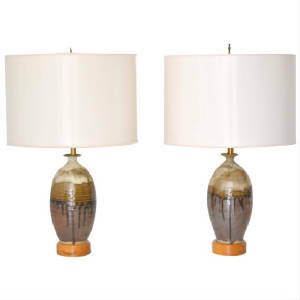 Glamorous pair of Mid-Century ceramic urn form table lamps, circa 1960s-1970s. 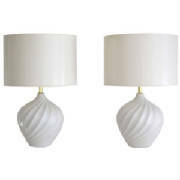 These striking bulbous form linen white glazed lamps are accented with white washed wood bases and capitals and wired with brass fittings. Overall: 29" from base to top of shade x 14" diameter. Form: 18" from base to bottom of harp. Striking Mid Century Modern white enameled steel cylinder table lamp with chrome hardware by Robert Sonneman for George Kovacs, c. 1970s. 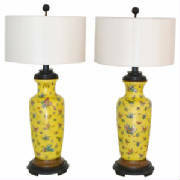 Striking pair of porcelain Chinoiserie vase form polychrome table lamps, c.1950s - 1960s. 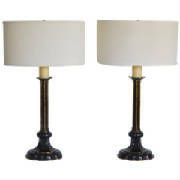 These Hollywood Regency style lamps are mounted on carved ebonized wooden bases and wired with brass fittings. Wood base: 6.5" x 6.5". 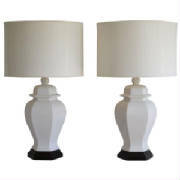 Striking pair of Hollywood Regency style Blanc de Chine jar form table lamps, c. 1960s - 1970s. These lamps have been designed with a bamboo motif and mounted on ebonized wood bases. Shades not included. Overall: 33"HT x 8" Diameter; height can be adjusted by adding taller or shorter harp. Form: 22"HT from base to bottom of the harp x 8" diameter. Pair of striking Mid-Century Modern Asian inspired vibrant yellow crackle glazed ceramic jar form table lamps by Tyndale, c. 1960s. These highly decorative lamps are mounted on black lacquered metal bases and have been rewired with brass fittings and brown silk/nylon cords. Measurement: Overall height from base to the top of the finial is 30". The height of the actual form from the base to the top of the capital is 18". 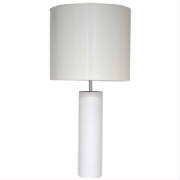 The diameter of the lamp at its widest is 11". The overall height can be easily adjusted up or down by adding a larger or smaller harp. Shades are not included.. 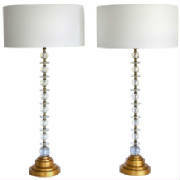 Exquisite pair of Hollywood Regency Style vase form table lamps by Paul Hanson, circa 1950-1960. These stunning yellow glazed Chinoiserie inspired lamps designed with custom made ebonzied bases and capitals and brass decorative accents. Shades not included. Measurements: Overall Height: Base to top of finial 38"
Monumental bronze table lamp in the manner of James Mont, c. 1940s -1950s. This exquisite and highly decorative lamp with Ottoman Empire style detailing is mounted on a footed mahogany base. 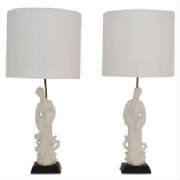 Overall Height Adjustable: 51" to 58"
Exquisite pair of Hollywood Regency Blanc de Chine Asian figural form table lamps, c. 1940s - 1950s. 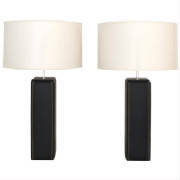 These stunning lamps are mounted on black lacquered bases. Base to bottom of harp: 20.5" ht, harp: 11". 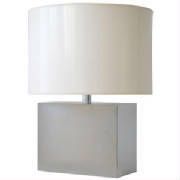 Unusual white molded three-sided acrylic table lamp with chrome fasteners by Neal Small Design, Inc., New York, New York. c. 1968. Small's designs can be found in The Collection of MoMA. 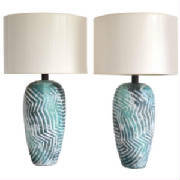 Striking pair of Mid-Century blue green polychrome crackle glazed ceramic jar form table lamps, circa 1950s - 1960s. 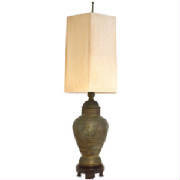 These stunning artisan crafted hand thrown lamps are mounted on turned wood bases and wired with brass fittings. Shades not included. Measurements: The height from the base to the top of the harp is 32" x 13" diameter and the height from the base to the bottom of the harp is 22.5". The height for shipping is 25". The height can be adjusted by adding a smaller or larger harp. 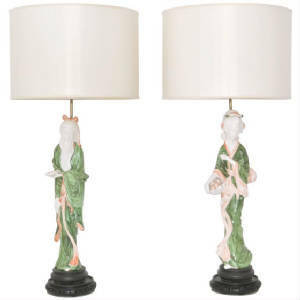 Striking pair of Hollywood Regency style Asian figural form table lamps, circa 1970s - 1980s. These stunning sculptural polychrome glazed ceramic lamps are mounted on ebonized bases. Shades not included. Measurements: The height from the base to the top of the harp is 39". The height can be adjusted by adding a smaller or larger harp. The diameter of the lamps is 7.5". Stunning Mid-Century gilt crackle glazed ceramic jar form table lamp, circa 1950s -1960s. 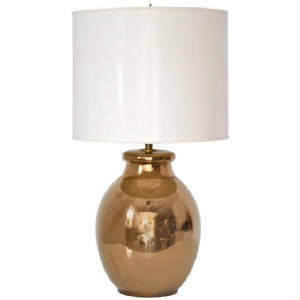 This highly decorative artisan crafted table lamp is wired with brass fittings. Shade not included. Measurements: The height from the base to the top of the harp is 32". The diameter of the lamp is 15" at the widest and 8" diameter at the base. The height from the base to the bottom of the harp is 22" and the height for shipping is 24.5". The height can be adjusted by adding a larger or smaller harp. 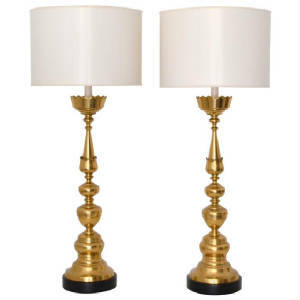 Glamorous pair of Italian Mid-Century turned brass candlestick table lamps, circa 1960s. These striking artisan crafted highly decorative lamps are mounted on turned wood ebonized bases and rewired with brass hardware and silk cords. Shades not included. Measurements: The height from the base to the top of the harp is 45". The height from the base to the bottom of the harp is 37". The height for shipping is 40". The lamp is 10" diameter at the base. The height can be adjusted by adding a smaller or larger harp. Striking pair of Mid-Century jar from ceramic table lamps, circa 1950s - 1960s. These stunning artisan crafted hand thrown polychrome glazed lamps of natural organic hues are mounted on custom turned wood bases and wired with brass fittings. Shades not included. Measurements: The height from the base to the top of the harp is 25" x 7"diameter. The height from the base to the bottom of the harp is 15.5". The height can be adjusted by adding a larger or smaller harp. The height for shipping is 18.5". 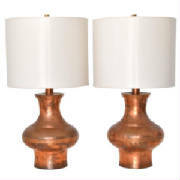 Striking pair of Mid-Century hammered copper table lamps, circa 1950s - 1960s. These sculptural lamps are wired with brass fittings. Shades not included. Measurements: The height from the base to the top of the harp is 31" x 13.5" diameter. The height from the base to the bottom of the bottom of the harp is 20". The height can be adjusted by adding a larger or smaller harp. 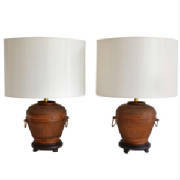 Stunning pair of Mid-Century brass urn form table lamps mounted on ebonized wooden bases, circa 1950s - 1960s. These striking Repousse decorated table lamps have been rewired with brass fittings. Shades not included. Measurements: The height from the base to the top of the harp is 36" x 9" diameter. The height from the base to the bottom of the harp is 25". The height can be adjusted by adding a larger or smaller harp. 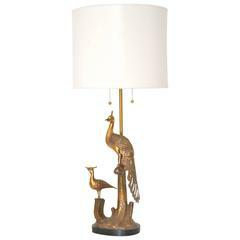 Incredible Mid-Century patinated brass sculptural peacock form table lamp by the Markoff brothers of the Marbro Lamp Company, circa 1950s. This striking artisan crafted lamp is mounted on an ebonized base and wired with brass double cluster fittings. Shade not included. Measurements: The height from the base to the top of the brass cluster is 48" x 14" L x 10" wide. 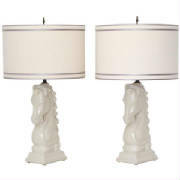 Striking pair of Mid-Century Blanc de Chine ceramic horse form table lamps, circa 1950s - 1960s. 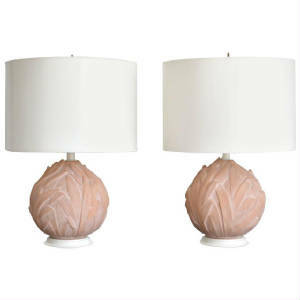 This stunning pair of highly decorative sculptural white glazed lamps are wired with brass fittings. Shades not included. Measurements: The overall height is 26" from the base to the top of the harp x 8"L x 5"W. The form height is 16" height from the base to the bottom of the harp. The height is adjustable by adding a larger or smaller harp. 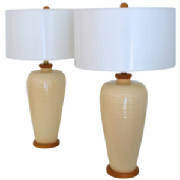 Striking pair of Mid-Century ceramic table lamps, circa 1950s -1960s. These stunning polychrome glazed highly graphic and decorative lamps are mounted on turned walnut bases and wired with brass fittings. Shades not included. Measurements: 38" height from the base to the top of the harp x 11" diameter. The form is 23" height from the base to the bottom of the harp. The height can be adjusted by adding larger or smaller harp. 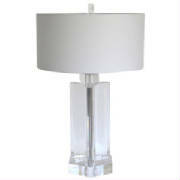 Masterfully crafted geometric form lucite table lamp. This Mid Century lamp is impactful in both design and dimension c.1960. Wired with chrome fittings and lucite finial. Shade not included. Striking Mid-Century white glazed ovoid form table lamp by Lotte, circa 1970s. 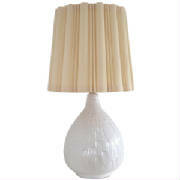 This stunning egg shell matte glazed lamp is in excellent original condition. Sold without shade. Measurements: Form height is 18" ht. From the base to the bottom harp 19" ht. Form is 11" diameter. Overall height from base to top of the harp 34" ht. 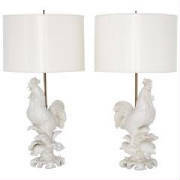 Stunning pair of Mid-Century Italian Blanc de Chine ceramic rooster form table lamps, circa 1950s - 1960s. These highly decorative hand thrown figural lamps are rewired with brass fittings and silk cords.1950s - 1960s. Shades not included. 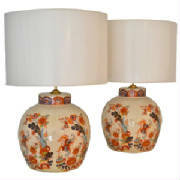 Stunning Pair of Hollywood Regency Chinoiserie inspired jar form table lamps by the Marbro Lamp Company, circa 1950 -1960. These incredible blood orange / red glazed lamps are adorned with gilt decoration and mounted on custom hand carved ebonized wooden bases. Shades not included. Measurement: the overall height from the base to the top of finial 37.5" x Diameter: 10". The form is 20.5" height from the base to the bottom of the brass riser. The brass riser is 15" height to the top of the brass double socket cluster. 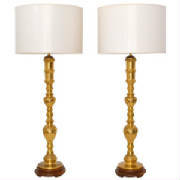 Exquisite pair Hollywood Regency ebonized candlestick table lamps with gilt accent, circa 1960s - 1970s. 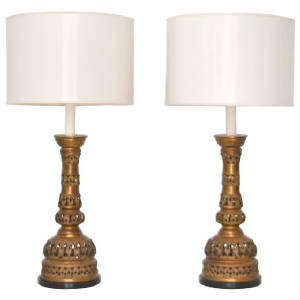 This pair of highly decorative carved wood table lamps are wired with adjustable antique brass double cluster fittings. Shades not included. Striking Mid-Century architecturally influenced column form table lamp, circa 1960s-1970s. This sleek tubular lamp is composed of alternating chrome and brass cylinders. Shade not included. 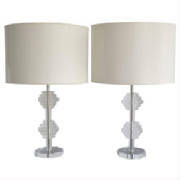 Stunning pair of Hollywood Regency Blanc de Chine faceted form ceramic table lamps, circa 1950s-1960s. These striking artisans thrown white glazed table are mounted on custom carved walnut bases and wired with brass fittings. Measurements: 31" height from the base to the top of the harp x 10" diameter. The form is 20.5" height from the base to the bottom of the harp. 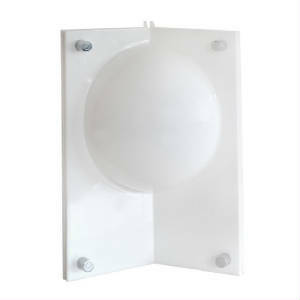 For shipping purposes the height is 23" form the base to the top of the electrical socket. The height can be adjusted by adding a larger or smaller harp. Shades not included. Glamorous Mid-Century Asian inspired ceramic table lamp, circa 1950s -1960s. 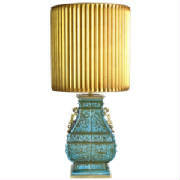 This stunning artisan crafted aqua and green polychrome glazed ceramic lamp is mounted on a brass base and decorated with patinated brass accents. Shade not included. 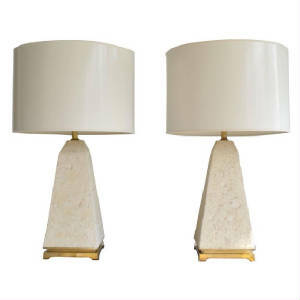 Glamorous Post-Modern tessellated stone table lamps, circa 1970s - 1980s. These striking lamps are designed of tessellated marble and wired with brass fittings. Shades not included. Overall: 30"ht from base to top of shade x 12" diameter. Form: 18"ht from base to bottom of harp. Glamorous Mid-Century Italian glass table lamps, circa 1960s - 1970s. 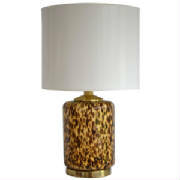 This stunning leopard pattern blown glass lamp is mounted on a brass base. Shade not included. Overall: 34"ht from base to top of shade x 11" diameter. Form: 20"ht from base to bottom of harp. Pair of striking Mid-Century Modern leather wrapped column form table lamps by L. Paul Brayton, circa 1970s. These geometric shaped lamps are double stitched on each corner and wired with chrome fittings. Overall height can be adjusted by simply adding a smaller or larger harp. Shades not included. Measurements; Overall: 5.5" L x 5.5" W x 34.5" H., Form: 5.5"L x 5.5" W x 18" H.
Pair of incredible Mid Century Modern organic form table lamps. These artisan inspired lamps of organic naturally formed wood are wired with brass fittings. Shades not included. Overall height from base to top of finials 41". Height from base to bottom of the harp 25.5" x 10" diameter. Striking Mid Century Modern marble column form table lamp with chrome hardware, c. 1960s - 1970s by Robert Sonneman, Shade not included. Striking Mid-Century rectangular table lamp by Kovacs, circa 1960s-1970s. 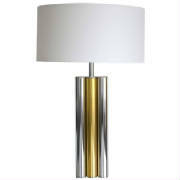 This stunning Minimalist lamp is artisan crafted with a mirror polished chrome finish and wired with chrome fittings. Shade not included. Measurements: Overall: 22" height from base to top of finial x 13" wide x 6.5" deep. Form: 12" height to bottom of the harp. Height can be adjusted by adding a smaller or larger harp. Incredible pair of woven reed and bamboo basket table lamps, c. 19th century. Basket form 14.75" H x 11.5" diameter. 19" ht. to bottom of light socket. Striking pair of Mid-Century polychrome ceramic bulbous jar form table lamps, circa 1960s. These stunning and graphic Artisan thrown ceramic drip glazed lamps are wired with brass fittings. Form: 16" diameter x 17" height from base to bottom of harp. 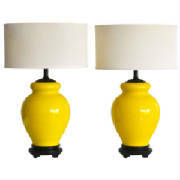 Pair of Mid Century Modern hand thrown butter glazed ceramic jar form table lamps, c. 1950s -1960s. 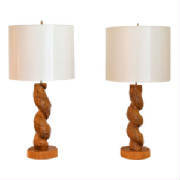 These handsome ridged lamps are mounted on custom oak bases and matching capitals. Sold without shades. Overall: 9" diameter x 30" ht. (Height can be adjusted up or down with harp, Form: 9" diameter x 20.5" ht. 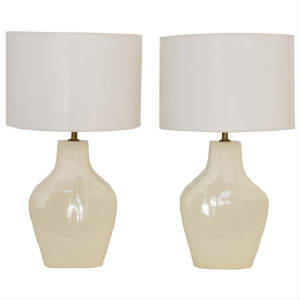 Stunning pair of Mid-century Blanc de Chine Jar form table lamps, circa 1960s. These striking lamps are artisan crafted to resemble rippled crest patterns and are wired with brass fittings. Overall: 28.5" height x 11" diameter. Form: 15" height to bottom of harp x 11" diameter. Note: Overall height can be adjusted by adding a smaller or larger harp. Striking pair of Mid-Century woven reed basket form table lamps, circa 1950s-1960s. These white lacquered sculptural lamps are wired with brass fittings. Overall dimensions: 34" height to shade x 13" diameter. Form: 22.5" to bottom of harp. 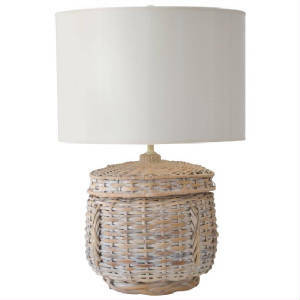 Glamorous Hollywood Regency style woven metal basket form table lamp by Maitland - Smith, circa 1970s. This stunning lamp is handcrafted of interwoven oxidized copper. The lamp is mounted on a brass base and wired with brass fittings. Overall: 33" height from base to top of shade x 16" diameter. Form: 21" height from base to bottom of harp. 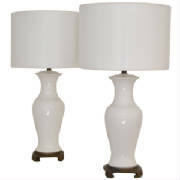 Glamorous pair of Mid Century Modern white glazed ceramic candlestick table lamps, c. 1950s - 1960s. 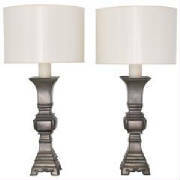 These decorative lamps are sculptural in form and mounted on footed ceramic bases. Shades not included. Overall: 34.5" height from base to top of shade x 7.25" diameter. 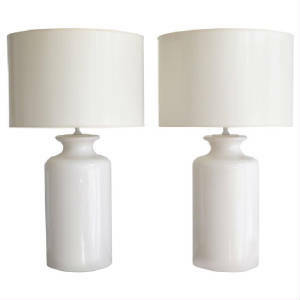 Striking pair of Mid-Century lucite table lamps, circa 1960s-1970s. These sculptural lamps are designed of undulating stacked lucite discs and wired with chrome fittings. Overall: 29" height from base to top of shade x 6" diameter. Form: 17" height to bottom of harp. Sculptural Mid-Century ceramic jar form table lamp, circa 1950s - 1960s. This striking hand thrown organic form lamp is lava glazed with alternating neutral earth-tone colors and wired with brass fittings. Overall: 39" height from base to the top of shade x 13" diameter. Form: 25" height from base to the bottom of the harp. Stunning and sculptural Blanc de Chine bottle form table lamp with modernist raised relief decoration, c.1960s - 1970s. Form: 13" diameter x 18" ht from base to top of porcelain neck. Striking pair of Mid-Century woven reed basket form table lamps, circa 1950s-1960s. These sculptural lamps are mounted on carved hardwood bases and wired with brass fittings. 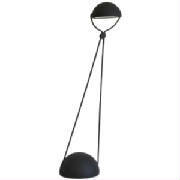 Measurements: Overall dimensions: 25" height to top of shade x 10" diameter. Form: 13" to the bottom of the harp. 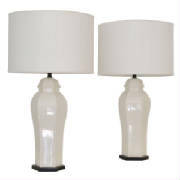 Glamorous pair of Hollywood Regency Blanc de Chine jar form table lamps, Italy, circa 1950s-1960s. 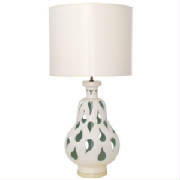 These striking artisan thrown lamps are finished in a white glaze and adorned with a decorative grape motif. Wired with brass fittings. Overall: 39" height from base to top of finial x 15" diameter. Striking Post-Modern Brutalist inspired table Lamp, circa 1970s-1980s. 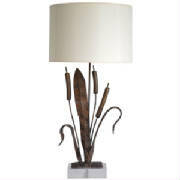 This sculptural hand wrought cattail form lamp is mounted on a lucite base and wired with brass double cluster fittings. Form: 26.5" height to bottom of riser. 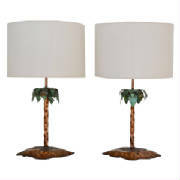 Sensational pair of custom made Post-Modern sculptural palm tree form tole table lamps, c. 1970s - 1980s. These hammered copper lamps are wired brass fittings. Shades not included. 31" H to finial x 14" L (base) x 10.5" D (base), 6.5" Diameter top of tree form. 20" height to bottom of harp. Height can be adjusted by an larger or smaller harp. 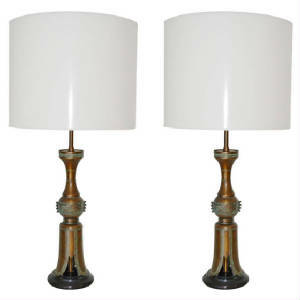 Striking pair of Hollywood Regency table lamps, circa 1960s-1970s. 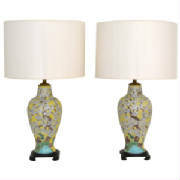 These stunning lamps are artisan crafted in a mottled cream glaze with gilt glaze accents and mounted on custom footed bases. Overall: 33" height from base to top of shade x 7" wide x 5.5" deep. 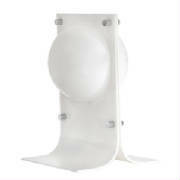 Form: 20" height to bottom of harp, height can be adjusted by adding a smaller or larger harp, wired with brass fittings. 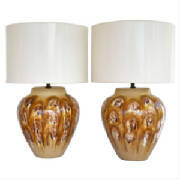 Stunning pair of Hollywood Regency Asian inspired ceramic crackle glazed table lamps, circa 1960s. These highly decorative and intricately glazed ginger jar form lamps have been rewired with brass fittings. The height can be adjusted by adding a smaller or larger harp. Shades not included.